Creating A College-Going Culture Starts With The Students Themselves "Every year, there are 1.1 million low-income 8th graders in America’s schools. 95 percent say they want to go to college, but only 9 percent of them will graduate by the time they are 24. In 1970, that figure was 6 percent. We have clearly not made much progress solving our educational equity problem. But there is an untapped resource that already resides in every low-income high school which holds a very important key to the solution: the students themselves." E4E Teachers Talk Back: Kayleigh White "Kayleigh White teaches social studies at a District 75 high school in New York City that serves students with severe emotional and behavioral disorders. In this interview with E4E-New York Outreach Director Erica Tunick, Kayleigh talks about her commitment to her students and the importance of school climate and restorative practices." Schools need real solutions to support and keep the best teachers "My first year of teaching was a near disaster. I was given the Common Core Standards and told to teach math to one special education class, teach ELL to one class with many beginners, and teach one general education class. I was assigned a mentor (a wonderful educator who I am now friends with), but that first year we barely had time to meet because I was running around trying to find paper and a working copier. As far as everyone at my school was concerned—including the students—I was a flight risk. They had seen teachers walk out, and many barely make it through the first year only to flee to teach high school or move on get their masters, or to teach at a charter school. The sad truth of teacher burnout was depicted in a recent report from Families for Excellent Schools. The best teachers often avoid the schools where their skills are needed the most, or use them as a stepping stone, which perpetuates a cyclical achievement gap where the best schools get even better. Students whose schools are struggling are left even further behind. Identifying data around this problem is a critical first step, but we then must work to identify and adopt specific solutions. It is difficult to teach in schools that are dealing with the challenges of concentrated poverty, and for that reason we need to incentivize strong teachers to move to and stay in these schools. Everyone can agree that when the lowest performing schools have the least qualified teachers, the problem of student achievement is only going to get worse – so how can we counteract this effect, and get the best teachers where they’re needed most?" Investment Announcement: Innovate Public Schools "New Profit, a national nonprofit venture philanthropy fund working to break down the barriers standing between people and opportunity in America, is investing $1 million over the next four years to support Innovate Public Schools (Innovate), a Bay Area-based nonprofit transforming education in low-income communities by supporting parents to become the leaders making change happen in their communities, providing accessible information on the problems and solutions in education, and partnering with districts and charters to create more high-quality schools." When a School is More than Just a School "A school is supposed to be a place of learning. Great schools are where students acquire the knowledge and habits they need to succeed in college and life. And they can be even more than that—they can also become community hubs and bring together people from throughout the neighborhood. What happens after that last bell rings and classes are dismissed? Does the school go to sleep, or does it come alive with after-school activity? Over the past five years, as a teacher and assistant principal at KIPP Explore Academy in Houston, TX, I’ve seen what it looks like when a school hums with activity throughout the week. By offering great extracurriculars and after-school activities—including a thriving baseball program and student performances each spring—KIPP Explore has become a place where people come to learn and to enjoy themselves and each other." KaBOOM! An embodiment of positive civic engagement "Last Saturday, the KaBOOM! organization made its way downtown, toward the Fox Park neighborhood, to build a playground for the newly established Knowledge Is Power Program (KIPP) Wisdom academy for elementary school students. The design, championed by three Washington University students—senior Carrick Reddin, senior Brendan Ziebarth and junior Rylie Davis—focused on creating a play space that would give young children ample learning opportunities in a novel, natural ecosystem." 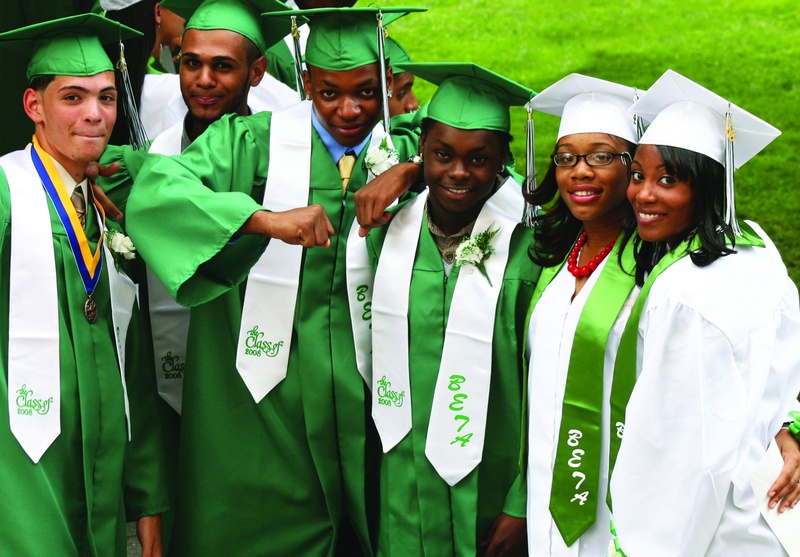 Urban Charter Schools Often Succeed. Suburban Ones Often Don’t. "Charter schools are controversial. But are they good for education? Rigorous research suggests that the answer is yes for an important, underserved group: low-income, nonwhite students in urban areas. These children tend to do better if enrolled in charter schools instead of traditional public schools. There are exceptions, of course. We can’t predict with certainty that a particular child will do better in a specific charter or traditional public school." Helping veterans transition to everyday life "González was lost until he found Mission Continues, a national nonprofit organization based in St. Louis that aims to empower veterans through community service. 'It was something that I had been missing,' said the Kendall resident, who completed a six-month fellowship for the organization. He soon found what he was lacking by being around other veterans and doing community service projects." New Teacher Center Receives Prestigious Investing in Innovation Grant "New Teacher Center (NTC), a new profit partner in the Reimagine Learning Fund, was named one of the highest rated applicants for the Investing in Innovation (i3) Scale Up Grant by the U.S. Department of Education." From Disillusionment to Rejuvenation: An inspiring story from a first-year teacher "In December, I shared part of an email I received from a first-year teacher who came across my article 'Phases of First-Year Teaching' online and candidly shared she was 'slowly wading through disillusionment' and 'trying not to drown.' She said my article helped her realize she’s not alone. Even though it’s a story I’ve heard time and time again, I was so moved to hear directly from this new teacher who was desperately struggling in isolation. This teacher and her story stuck in my mind. I had to help. I emailed her back that very night and, in the weeks that followed, I connected her with my New Teacher Center colleagues and one of our highly-trained mentors. Earlier this month, I invited this new teacher to share her story as a surprise at a closed gathering during New Teacher Center’s 14th National Symposium on Teacher Induction. As she spoke, I watched the faces of others in the room. I saw nodding heads, knowing smiles, and many tears. Above all, I saw a renewed inspiration for the work we do. Right then I knew this teacher’s story was too powerful not to share outside those four walls. Read her story. Share it with others who need to understand the realities of the classroom. Share it with those who need to understand the importance of making sure all new teachers get the support they need to help all students succeed. Share it with those who can join us in making that a reality." Investment Announcement: Third Sector Capital Partners "New Profit, a national nonprofit venture philanthropy fund working to break down the barriers that stand between people and opportunity in America, is investing $1 million over the next four years to support Third Sector Capital Partners, Inc., a 501(c)(3) organization that leads governments, high-performing nonprofits, and private funders in building evidence-based initiatives that address society’s most persistent challenges."